The Eucharist is one of four sacraments that imparts the forgiveness of sins. The waters of baptism wash away all prior sins. Both sacraments of healing — reconciliation and anointing — also grant forgiveness. The sacrament of reconciliation grants the absolution of both mortal and venial sins, and it offers God’s pardon and peace. And the instruction to the sacrament of anointing says, “If they have committed any sins, their sins will be forgiven them” (see Jas 5:15). When we attend Mass, even if we have not committed a mortal sin, we still have blemishes on our souls, the venial sins that we have committed. Some of these sins may be smaller, others may be larger, but they offend God and alienate us from his son Jesus and the body of Christ, the Church. 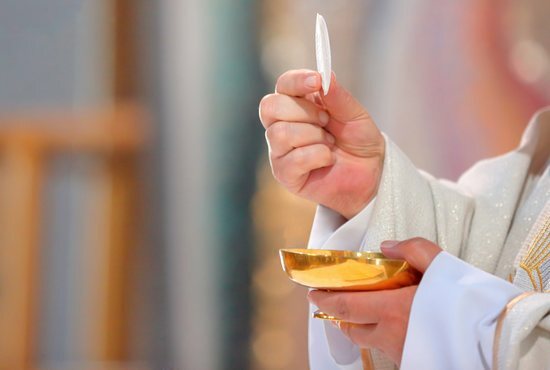 A person with venial sins is still in the state of grace, and he or she is not only eligible to receive holy Communion, but also is encouraged to receive holy Communion. Then, when we receive the Eucharist, “Holy Communion separates us from sin … the Eucharist cannot unite us to Christ without at the same time cleansing us from past sins” (Catechism of the Catholic Church, No. 1393). When Jesus comes to us in the Eucharist, he wipes away our venial sins (see No. 1394). Jesus made the Eucharist-forgiveness connection at the Last Supper when he took a cup of wine and said, “This is my blood … which will be shed on behalf of many for the forgiveness of sins” (Mt 26:28). The first generation of Christians considered the gift of forgiveness in the Eucharist to be a foundational belief: “by his blood … [we have] the forgiveness of sins previously committed” (Rom 3:25); “the blood of … Jesus cleanses us of all sins” (1 Jn 1:7); and, “Jesus Christ … has freed us from our sins by his blood” (Rv 1:5). It is important to make a distinction when it comes to the forgiveness granted through the reception of the Eucharist: venial sins are forgiven, but mortal sins are not. The Catechism states, “The Eucharist is not ordered to the forgiveness of mortal sins — that is proper to the sacrament of reconciliation” (No. 1395). St. Paul explained the danger of receiving holy Communion when a person is separated from God and neighbor: “Whoever eats the bread or drinks the cup unworthily will have to answer for the body and blood of the Lord (1 Cor 11:27). A person with a mortal sin is not in the state of grace, and the path to holy Communion is to approach the sacrament of reconciliation first, receive sacramental absolution, be restored to the state of grace, reestablish full communion with the Church, and then receive holy Communion. When we receive the Eucharist, Jesus extends to us his love, compassion, mercy, healing grace, pardon and peace. He offers us a new beginning, strengthens us in the battle against future sin, and nourishes us to live a virtuous and holy life.